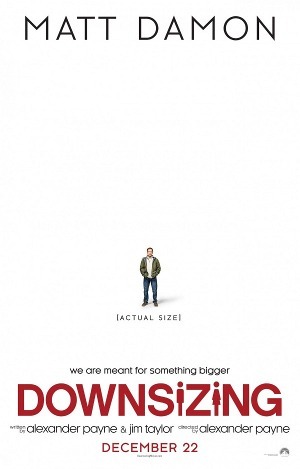 Downsizing is an odd film with an intriguing premise and unusual concept that gets a little lost along the way as the film takes a hard-right turn leaving you unsure, exactly, where the story is ultimately heading. Matt Damon and Kristen Wiig star as a couple who decide to take part in an unusual scientific adventure which will shrink them to only a few centimeters tall. Initially created as a way to preserve the world's dwindling resources, downsizing gains popularity as a middle-income family like the Safraneks can live like kings for only a fraction of the price in ritzy miniature communities. Of course, things don't go exactly as planned. Director and co-writer Alexander Payne has delivered some strong films over the years (The Decendants, Sideways, and Nebraska), but despite a promising set-up, Downsizing never reaches its full potential. That said, there's some fun to be had (even if the ecological preachiness doesn't match the offbeat humor). Without giving away the twist, the film explores the miniature world through Paul's eyes focusing on the odd characters he meets (such as Hong Chau and Christoph Waltz) as he learns to look at life from a different perspective that really doesn't have much to do with his relative size. With Star Wars: The Last Jedi opening a week earlier, the Christmas weekend looks a bit sparse. For those not wanting to see Star Wars again, Downsizing is the best bet (albeit more by default than anything else given the lackluster competition). Damon is likable on screen, the script takes some unexpected turns, and the concept is unique enough to get through the rougher patches (or even complaints about its "white savior" narrative). It doesn't match the level of some of Payne's earlier work, and it lacks the sharp bite that the satire really needs, but for those looking for fun holiday fare you could certainly do worse.